We continue to develop our monthly Saturday morning meeting at Lily & Lime LD Cafe on the 3rd Floor of the Portsmouth Central Library, Guildhall Square between 10-12pm. A great chance to bring the family, enjoy the Lily & Lime food and drinks, discuss various things and meet others interested in developing projects. On Saturday 12th May we organised it in conjunction with ME Foggy Dog as part of the ME Awareness Week. Unfortunately the response was poor from the public to visit the ME display, but please help promote ME Awareness through your Social Media sites, it would be good for more people to help build awareness about the Missing Millions Campaign. Lily & Lime LD (Facebook Link) make us really welcome and we hope it is making everyone aware of the facilities they are offering for adhock meetings or events you might be interested in running. We did our initial Let’s Hearing training there and it was brilliant. Our next meeting The Parenting Network will be available to share some of the exciting initiatives they are getting off the ground in Portsmouth, including the Family Card. So make a date to come along on the 9th June. We were chartered officially as a Rotary Group (Club) on Saturday 3rd March 2018, but unfortunately snow prevented this from happening as the Rotary International in Britain & Ireland President Denis couldn’t sign the certificate or present it. So on Thursday 10th May this was all rectified in Romsey, when President Janice received the certificate. It was fantastic that members of Rotary Social Innovation SE Hampshire and others could support Toucan Diversity, rowing as a Dragon Boat team at the Portsmouth Rotary Dragon Boat Festival at Lakeside, North Harbour on Sunday 13th May. Great fun was had by all, even if we came second in all three races. See pictures below showing our efforts. On the 21st July they are also having a Family Fun Day from 10.00 to 4.00.p.m. More information from the Portsmouth Disability Forum. Don’t forget to look out for activities taking place in your community between 21st May and 27th May when it is Dementia Action Week. Lots going on through the week in Portsmouth and South Wiltshire, especially the launch of the Amesbury Dementia Action Alliance at Stonehenge on Monday 21st May at 4.00.p.m. Taking risks are an integral part of encouraging change, innovation and personal growth however in today’s risk adverse climate it can be tricky for artists and organisations to pull these off successfully. The Risks, Rights and Reputations workshop will signpost you to the tools and information you need to successfully prepare for, execute, deliver and evaluate projects that embrace artistic risk. 3rd August more information from Eventbrite and an opportunity to book. 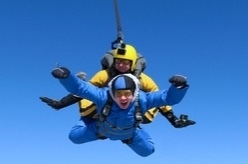 Alabaré Skydive on the 10th November, to help homeless veterans. It is hoped that other members and friends will help Janice collect the pounds towards her sponsorship. We also recommend a visit to the Alabaré Garden Centre in Old Sarum, which is a little gem with lots of plans for development, which perhaps we can help with in the future. Talking of Gardens, a meeting on Wednesday 23rd May at Coffee at Home in Cosham High Street is taking place to explore the creation of a Community Garden, watch this space. We are also exploring dates for an Indian Meal Face2Face meeting in Southampton, we will hope members living in that area will want to come and anyone else who is interested. Do keep an eye on our new developments in South Wiltshire, there is a lot of interest in forming a Satellite Club. Lots of people are interested in helping to form this, with a focus point around Amesbury. We are still exploring expanding our membership in the East Hampshire area, any help in making contact with Social Enterprises, Businesses or interested people in the Petersfield, Whitehill and Bordon areas would be appreciated. We were also delighted to attend the Portsmouth Together day Social Action Learning Journey. We do believe Social Action is very much what we want to be involved in, particularly in the Community Asset based Approach.